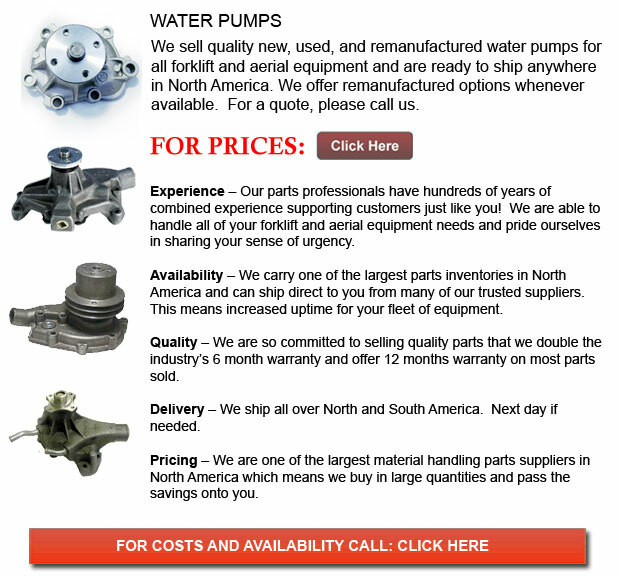 Forklift Water Pump - The water pump is connected to the engine's crankshaft. It is a basic centrifugal pump which is driven by a belt which is connected to the crankshaft. Whenever the engine is running, the pump circulates fluid. The water pump uses centrifugal force to send water to the outside as it spins. This action causes fluid to be constantly drawn from the center of the pump. The pump inlet is positioned near the center. This particular design enables fluid coming back from the radiator to hit the pump vanes. The pump vanes are strategically placed to be able to fling the fluid outside of the pump so it enters the engine. The fluid that is exiting the pump initially flows throughout the engine block and cylinder head. Then the fluid travels into the radiator and lastly circulates back to the pump.